Since 1947, the OYC has been teaching the joys of sailing to generations of children. Children who once learned to sail on Town Cove are now sending their own children and grandchildren here to learn. Everyone can learn to sail and skills learned at the OYC can be used and enjoyed for a lifetime! Novice to experienced students can expect to spend plenty of time out on the water (using three classes of sailboats: Optis, Catalina/Precisions and 420s) as well as time onshore in the clubhouse with chalk talks and demonstrations. This combination of classrooms teach solid sailing and seamanship skills ranging from terminology, knot tying, sail trim, safety, and boat care, to advanced sailing theory, racing rules and tactics. Our instructors ensure a fun and safe learning experience by combining instruction, educational games and activities, and LOTS of time on the water sailing! The JSP staff is comprised of US SAILING certified Senior Instructors leading the classes and a number of Junior Instructors assisting them, who ALL share a passion for sailing. Most of our instructors in fact have learned to sail here at the OYC themselves. Our staff is also American Red Cross AED/CPR and First Aid certified and we have a certified Lifeguard on duty every day. All of our lessons focus on fun and safety and emphasize the Corinthian Spirit (good sportsmanship, good attitude/behavior, fairness, determination, and the ability to win or lose gracefully) as well as the Seaman’s code of honesty, courtesy and consideration towards others. Private lessons are available for individuals, couples or groups of all experience levels and ages. Please direct private lesson inquiries to the OYC office after June 1st. OYC Membership is not required to be part of our program - all children are welcome! Rates, refund and cancellation policies are noted on the application. Classes are filled in advance on a first-come first-served basis and enrollment is required in advance. Our program is unable to accommodate day-of enrollment or drop-in students. Sail for one week, all eight, or anything in between! A minimum of 2 consecutive weeks is strongly recommended. **July 4 NO CLASS ON THURSDAY JULY 4! RSVP Required by August 14th. We have t-Shirts for sale at the club. FOURTH OF JULY PARADE: Those enrolled in the program for Week 2 may participate in the Orleans Parade as part of the JSP float. Details will be posted on this page by June 15. TUESDAY NIGHT JSP SOCIALS: The JSP offers weekly Tuesday night social activities such as movie & ice cream nights, sunset sailing, tie-dye parties, etc. CLICK HERE for schedule & times & details. Pay online via green button above, or mail check. To guarantee placement, application must be complete and submitted with supporting documentation, including payment for enrollment. Incomplete applications do not guarantee placement. CLICK HERE for information about the Robert Radtke Memorial Fund, Inc. sailing scholarships (applications available early March and deadline is end of April). Lessons begin promptly as scheduled! We hope that each child will attend all scheduled classes in order to gain the greatest benefit from the program. All cell phone/web devices are to be turned off and put away during class. Learn to sail! This class is for students ages 8-17 who may have little or no experience on the water, in sailboats, or who do not have a history of organized instruction experience. This class covers the fundamentals: parts of the boat, rig and de-rig, understand the wind, points of sail, tacking and jibing, capsize recovery, and basic right of way rules. Students will often remain in this class until they are comfortable on the water in varying conditions and when basic requirements are met. Groups are taught in Precision 15s, Catalina Capris, and some students may be introduced to solo sailing in Optis. At this level, students ages 10-17 will further develop their fundamental sailing skills and build on their experience. Students will sail Precision 15s, Catalina Capris, and solo in Optis. Simple racing skills will be introduced and as appropriate, students will be introduced to 420s. For the more experienced sailor who isn’t strong enough or old enough to sail a 420. This class sails Optis and goes deeper into understanding racing rules and theory, along with advanced Opti rigging and boat handling skills. Participation in Green Fleet regattas will be encouraged with some parent assistance. Students will eat lunch together and stay on yacht club property from 12 noon to 1:00 on Tuesdays. For the more experienced young sailor. This class sails Catalina Capris and Optis while introducing and practicing basic racing skills and introduces sailors to the 420s. Students will be on their own for lunch from 12 noon to 1:00 on Tuesdays. For the experienced 420 Sailor. This class sails 420s and goes deeper into understanding racing rules and theory, along with advanced boat handling skills, spinnaker and trapeze skills. Towing and rescue procedures are introduced. Students will be on their own for lunch from 12 noon to 1:00 on Tuesdays. For the more experienced young sailor. This class focuses on the “adventure” aspect of sailing where students can learn more about the wider world of sailing. It is intended to produce knowledgeable all-around boaters and include advanced sailing skills, seamanship, navigation, etc. Day Sailors, Flying Scots or other OYC boats may be used. Towing and rescue procedures are introduced. Students will be on their own for lunch from 12 noon to 1:00 on Tuesdays. This class is intended for experienced 420 sailors and is our highest level of junior sailing. The curriculum includes sail trim for speed, regatta preparation, boat maintenance, advanced racing strategy and rules, team and fleet racing with area Clubs, and tactics. As representatives of the Orleans Yacht Club, the 420 racing team will compete in local and regional regattas. For Skippers, Advanced, 420 and Opti Race Teams and select Intermediate sailors. This afternoon of races is an optional activity for sailors interested in practicing and bettering their racing skills and competing in a regatta-like experience with their friends. Dinghy starts for the Optis, Capris, Precisions and 420s. Questions regarding placement? Call the OYC Office at 508-255-9091 or send email to office@orleansyachtclub.org. OPEN SAIL: From 5 to 7 p.m. on Wednesdays (June 26 through August 14). Cost is $10 per sailor. JSP staff will be available onshore to assist with sails, boats, etc. Note: This is a time to practice established skills in a more casual atmosphere. Instructors will be present to support the sailors; instruction will not be offered during this time. All JSP staff, students and their families are invited to join OYC members for a “Friends & Family Night” BYO picnic. Come enjoy this casual evening under the tent - RAIN OR SHINE! Bring your own picnic supper or favorite take-out, or even just an hors d'oeuvres to nibble on while watching your young sailors enjoy Town Cove. This is the perfect opportunity for you to meet other JSP families! The bar is open and the Club’s gas grills will be available for those who wish to BBQ (bring your own utensils, dinnerware and condiments). Come meet OYC Members, JSP Staff, other JSP students and their families, the OYC adult sailors, and enjoy our beautiful view of Town Cove! The JSP offers weekly social events on Tuesday evenings 6-8pm which include ice cream/movie nights, tie-dye parties, sunset sailing, etc. Connect With OYC Junior Sailing on Facebook and Instagram! Can I add additional weeks? What if I have to change the enrollment dates? Yes! Weeks can be added depending on availability and advance notice is strongly encouraged. We do our best to give preference to students already enrolled in classes for additional future sessions. If enrollment dates need to be changed for any reason, please contact the OYC Office as soon as possible. Students can be dropped off/picked up from the white tent at the rear (water side) of the Orleans Yacht Club, 39 Cove Road, Orleans. Instructors will lead them to classes from there, and will dismiss them from there as well. In the OYC Clubhouse and on Town Cove between the OYC and Hopkins Island. How are the instructors organized? There is a Senior Instructor in charge of each level of instruction. There are a number of Junior Instructors and Junior Assistant Instructors who assist the Senior Instructors. Yes! There is a supervised Tuesday Night Social activity and there is a BYO cookout for JSP students and their families as well as OYC members every Wednesday evening from 5:30 - 8:30 p.m.
Are there any requirements other than age? As part of the first day of classes, participants are required to pass a rudimentary swim check. They must also wear closed-toe footwear on land and in the boats, and a PFD (life preserver) must be worn on the boats and in the water. Can observers watch the lessons? There are tables under the tent which provide a good vantage point for all the action. Does the OYC offer sailing lessons for adults or parents? Yes, private lessons can be arranged. Please call the OYC office for details. On rainy days, if it isn’t too windy, sailing classes will be held on the water. It is essential that students bring rain gear and be prepared to sail. In the case of a forecasted thunderstorm, the decision will be made by the Program Director if the children will sail. Classes will be held on land if they do not sail. There is no refund if students have class on land due to inclement weather. Please call the OYC Office BEFORE the start of class if your child will be absent. We take attendance and will call if your child is unaccounted for. Will classes on July 4 be rescheduled? Please contact the OYC Office at 508-255-9091. Current refund & cancellation policies are noted on the application. Is OYC membership required to enroll my child in the sailing program? No. The sailing program is open to ALL children aged 8-18 as long as they are 8 years old on or before June 1. What can my child expect from the program? There will be a swim check: A swim check is given to all students on their first day of class. It will consist of a 10 yard swim and 3 minutes of treading water and is overseen by our certified lifeguards. Students must pass the swim check to participate. The goal of the swim test is to assess the comfort of the student in the water. There will be weather changes: Sailing in different weather conditions is an integral part of the learning experience and many classes are conducted in the rain - students are expected to attend classes and be dressed appropriately for the weather. How can I help my child have a good experience with the sailing program? Easy - be involved and supportive! Ask them what they have learned. Have them show you the new skills they are learning. Encourage them to practice their skills when they are on and off the water. Your questions and interest in what they’ve learned adds to their enthusiasm for sailing! What else can I do or need to know? Our rules and regulations are in place for a reason so we ask for your patience & cooperation. Parent/guardian may request verification of background checks, copies of health care and discipline policies as well as procedures for filing grievances from the OYC Office. The OYC complies with the regulations of the MA Department of Public Health and is licensed by the Orleans Board of Health. We only know about issues, concerns, compliments, expectations, etc. if we know about them – please do not hesitate to talk to the Camp/Program Director after class. We value all communication. Please confirm student’s arrival/departure with a JSP Senior Instructor before leaving the premises. Plan to arrive at least 10 minutes early. Students can have a seat under the tent at the rear of the building – this is the pick-up drop-off location. Parents of Beginners & Intermediates are invited to stay on Mondays for a group orientation. While we constantly encourage students to advance, there are necessary skills that need to be mastered first. We understand that every child learns at their own pace so we do not have a predetermined amount of time set for each level. Students are responsible for their own advancement by demonstrating required skills & confidence on and off the water to their instructor(s). Students and parents will be notified of class advancement. All questions about placement/advancement can be directed to the Program Director after class. If your child is going to be absent from a class for any reason, or needs to arrive late/leave early, please call the OYC office to notify us in advance of the class session. Parents and guests may not be accommodated in the classroom or on the docks during instruction. They are welcome to wait under the tent for their child. The Orleans Yacht Club’s Junior Sailing Program seeks to instill in its students a joy of sailing and an understanding of the Corinthian Spirit, which upholds the values of integrity, honesty and service to the boating community. Those students who complete all levels of the program will understand the fundamentals of sailing theory and will demonstrate a proficiency in handling a small sailboat in various conditions, including racing. They will also become aware of the safety issues surrounding the use of boats on the water. 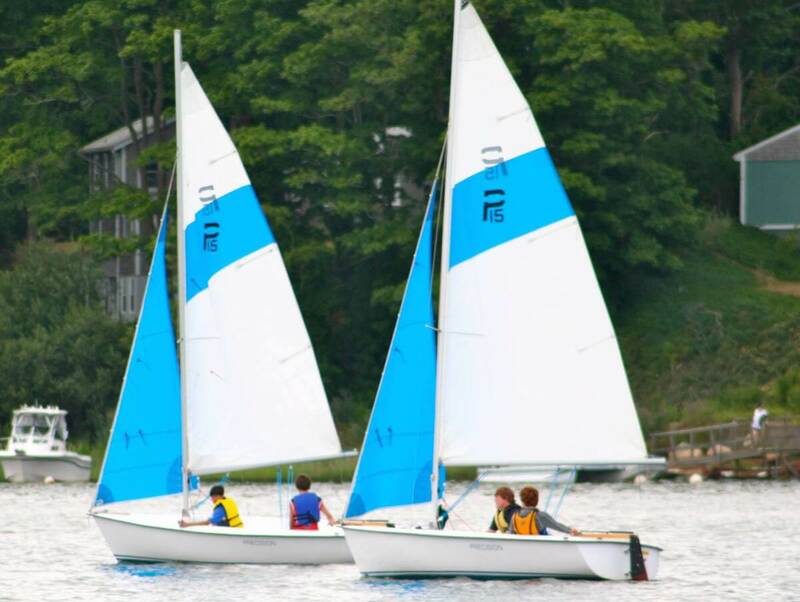 The OYC’s Junior Sailing Program complies with regulations of the MA Department of Public Health and is licensed by the Orleans Board of Health. This award is presented to the Junior Sailing Member who has demonstrated the most improvement in his or her racing skills during the summer Junior Sailing Program. The recipient shall be selected by a committee consisting of the Vice Commodore, the JSP Camp Director, JSP Head Instructor and the Junior Sailing Program Racing Coach. This perpetual award is in the name of William B. (Bill) Moore in recognition of his interest in racing as demonstrated by his racing skills, knowledge, participation in teaching, and promoting and supervising racing at the Orleans Yacht Club. This annual award is to be made to the Junior member who is considered the most outstanding in participation in scheduled activities, sportsmanship, seamanship, teamwork, helmsmanship and general qualities of ability and leadership. The recipient shall be selected by a committee consisting of the Senior Yacht Club's Commodore, Vice Commodore, Rear Commodore, and the Junior Sailing Program Director. This perpetual award is in the name of Mrs. Robert W. MacGregor, who, over the years after the Club’s founding, had contributed much and often in many ways. This award was originally presented to the Orleans Yacht Club on January 20, 1968 by W. Rodney Huber and Malcolm M. Dickinson. This award is presented to the Junior Sailor who best exemplifies sportsmanship, teamwork and cooperation. It is named after William K. Daniells of Orleans, who was a member of the Race Committee for many years, a staunch supporter of the Junior Sailing Program, and who best exemplified those qualities of sportsmanship and commitment that make a true yachtsman. The recipient shall be selected by a committee consisting of the Orleans Yacht Club's Commodore, Vice Commodore, Rear Commodore, the JSP Camp Director & JSP Head Instructor. This annual award for “outstanding regatta participant” is presented to the Junior Sailor who best exemplifies an infectious passion, enthusiasm and love for the sport of sailing. It is named after Alex B. Haas of Brewster, MA who started in the program when he was ten years old and worked his way up to the Race Team by the age of fourteen. Alex’s passion for Regattas was evident in his participation in as many as ten in any given summer. He was always looking to improve his sailing experience beyond the hours at the OYC and it proved worthwhile as he was recognized as the first junior in the 2002 and 2003 New England Laser District 7 Championships. Alex was an outstanding sailor whose skills inspired many. The recipient of this award shall be selected by a committee consisting of the OYC’s Vice Commodore, the JSP’s Camp Director, JSP Head Instructor and the JSP’s Senior Sailing Staff. This annual award is presented to the Junior Sailor or JSP Staff Member who best exemplifies the fun, enthusiastic and cooperative spirit of the Junior Sailing Program. The recipient is adventurous, a continuous model of the JSP Spirit during activities such as the Fourth of July parade, Pirate Day, Junior Olympics, etc. as well as someone who demonstrates ship-shape and safe boating. Other criteria for this award are: four weeks of participation minimum, punctuality and self-discipline and has the ability to inspire confidence in others. Established in 2016, this award is in memory of and honors Commodore Peter Howerton (2009-2011) who was well known for his good nature, his love of and unwavering dedication to the Junior Sailing Program. His ability to engage with both the Instructors and the students especially during the JSP’s annual “Pirate Day” is fondly remembered by many. The recipient of this perpetual award shall be selected by a committee consisting of the OYC’s Vice Commodore, the JSP’s Camp Director, JSP Head Instructor and the JSP’s Senior Sailing Staff. Full Name of Sailor (or sailors if payment is for more than one applicant): This field requires text. This field requires a number. First fill out your application to determine your payment amount. The Orleans Yacht Club, Inc. and Robert Radtke Memorial Fund do not and shall not discriminate on the basis of race, color, religion (creed), gender, gender expression, age, national origin (ancestry), disability, marital status, sexual orientation, or military status, in any of its activities or operations.